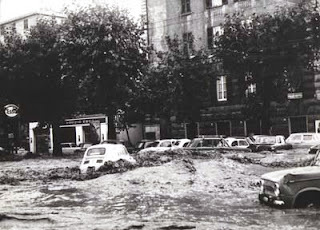 "Dolcenera" is about a tryst that never came about due to the disruption of a major flood, such as occurred in Genoa in 1970. 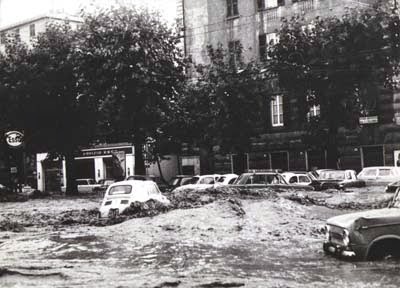 The term "dolcenera" refers to the dual nature of water - sweet when it is pure and life-giving, and black when it is fouled and out of control as in a flood. Against the backdrop of the flood, a man watches and waits anxiously for the woman to arrive. But it never happens, as she is stranded in a tram, unable to reach any distance, deceived and disappointed by the promise of an adulterous love that never came to pass. The theme of solitude in this song plays out as the loneliness of two lovers who are unable to meet. Look at her who’s arriving, what’s she like what’s she like? Watch her as she arrives, watch that it’s her, that it’s her. Watch her as she arrives, watch, watch, what’s she like? Look at her who’s arriving, that it’s her, that it’s her. black that beats up, that throws down the doors. but closing doors and windows, closing doors and windows. black of bitter layers that pass the coffins. it doesn’t have any, it doesn’t have any. and the turmoil in the sky comes at the wrong time. water that smashes the mountain, that sinks land and bridge. but a big mess, a big mess. and the struggle gets slippery and profound. Look at her as she arrives, look, how is she, how is she? Look at her as she arrives, look that it’s her, that it’s her. water that squeezes the hips, tuna nets of passersby. had in one day the certainty of happening. cold like a sorrow, heartless Dolcenera. in the very midst of the time that now advances on her. so splendid and true as to be able to fool you. Look at her who’s arriving, look, how is she, how is she? 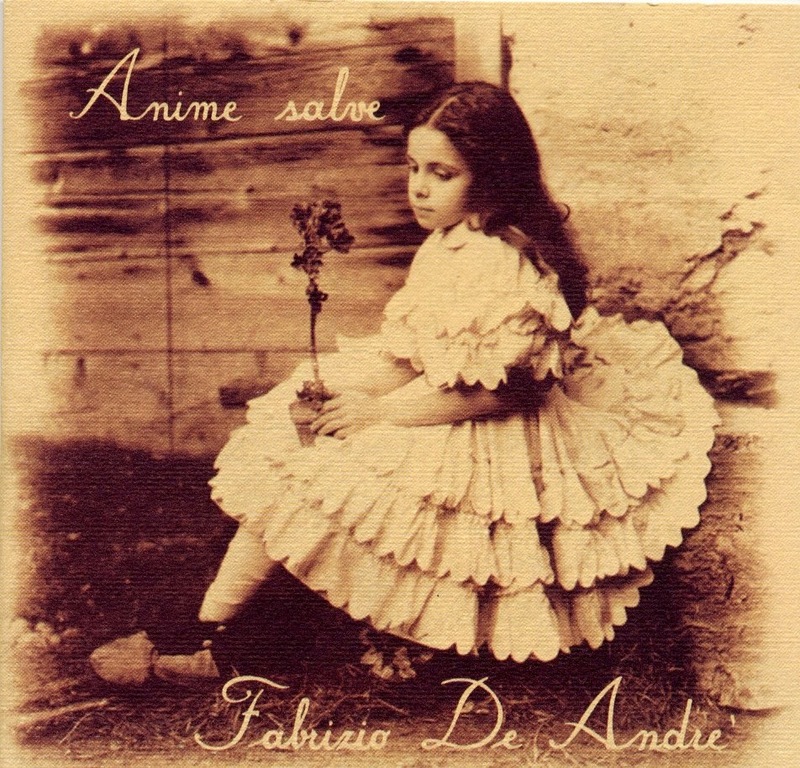 Anime salve was released in 1996, the last of De André's thirteen studio albums. 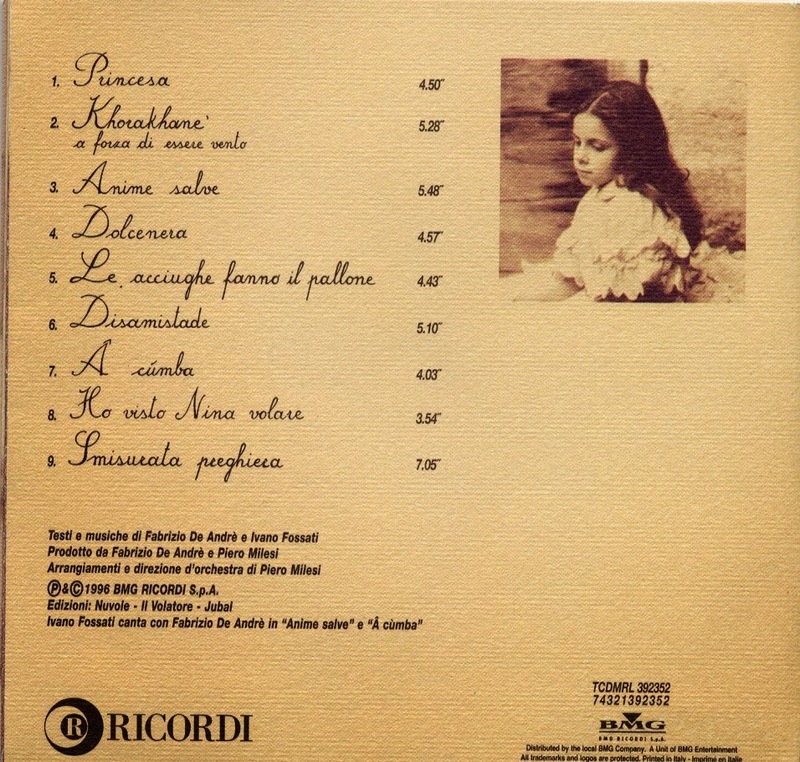 The songs were co-written by De André and Ivano Fossati, and the studio recording was co-produced by De André and Piero Milesi. De André referred to the album both as "a type of eulogy for solitude" and "a discourse on freedom." Here you will discover an album with De André at his full powers as lyricist and singer with his rich baritone in a musical setting that is striking, musically sophisticated and varied, with musical references to South America, the Balkans and the Mediterranean. The album was voted best Italian album of 1997 by the readers of La Repubblica and critics voted De André as the best Italian artist. The album also received the prestigious Targa Tenco prize for best album of 1997.